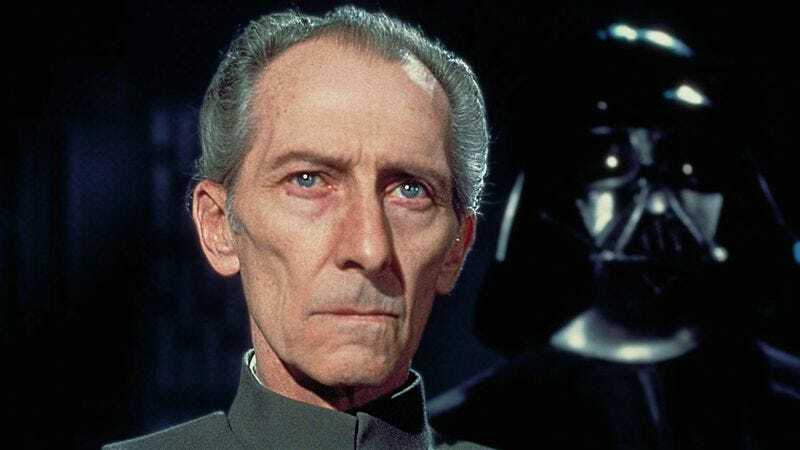 It’s not surprising that the character of Grand Moff Tarkin (Willhuff, if you’re nasty) would be appearing in the first of the Star Wars Anthology films. Rogue One takes place just before the 1977 original, and Tarkin has been featured on Disney XD’s Star Wars: Rebels, which appears to be leading up to the events of Star Wars: Rogue One. Plus, Tarkin is a fascinating character. How evil and powerful do you have to be in order to hold Vader’s leash? However, the CGI bit smells like Bantha fodder. George Lucas similarly recreated the likeness of the Hammer Horror favorite—utilizing makeup, digital trickery, and actor Wayne Pygram— for a cameo at the end of Revenge Of The Sith. However, with Disney and Kathleen Kennedy currently on the Star Wars Prequel Apology Tour, why would the team behind the new age of Star Wars go out of its way to create a digital version of a character when it could get an actual actor to take over the role? There’s an emphasis on physical, practical effects in the new films, and there’s nothing more physical and practical than a real live human being reading dialogue. Besides, Cushing (who died in 1994) has no business coming back from the dead. Christopher Lee played Dracula. He was always Van Helsing. Expect more rumors, credible and otherwise, to surface before December 16th, 2016, when Star Wars: Rogue One is released.